For the past several weeks there has been a little something in the works that culminated with an uplifting Ladies' Day at our church last Saturday. Isn't it incredible when things build upon each other and people come together for a common purpose? It's as if you can feel God's hand in all of it, which is the ultimate encouragement. 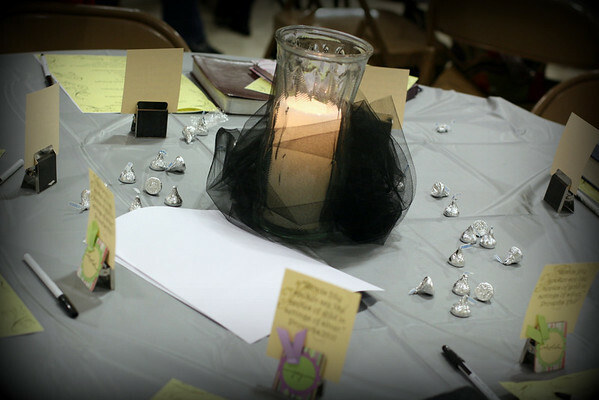 In January, our congregation started a memory work program to help us hide God's word in our hearts. It's for all ages, from the two year old class through teens and adults, with each grade learning a new verse each month. There are games, activities and even songs to help learn each verse. I know I might be slightly biased, but isn't that cool? In conjunction with that, we planned a Ladies' Inspiration Day with a goal to not only complement/build upon the new memory work program, but impress the importance of words in our daily Christian walk. We were honored to have a wise woman present three outstanding lessons on the effects of negative talk, the power of positive words (and how to keep our focus on them), and how to help our brains remember more of God's word. More on all this good stuff in just a bit. We decided to keep things simple with the decorations. Using plastic tablecloths is a big, fat decorating don't, I know, but washing, starching and ironing 13 fabric tablecloths afterwards is another decorating don't (at least for me). The favors were embellished big magnet clips that can be used to hold a memory verse or favorite scripture. 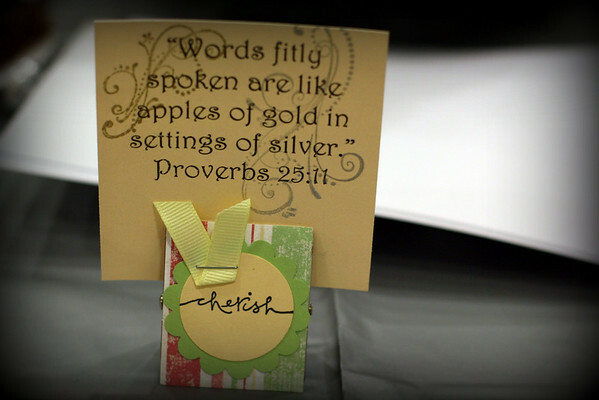 Proverbs 25:11 was the overall theme for the day, so each clip held a card with that verse printed on it. Aren't they cute? 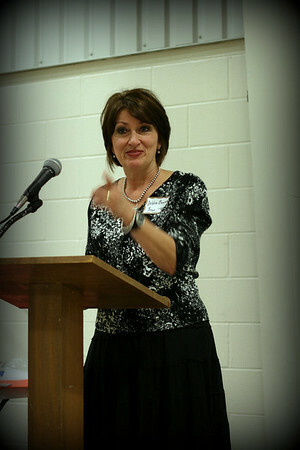 This was our fabulous speaker, Debbie B., who was not only an adorable spitfire, but she spoke with passion, conviction, honesty and humor and kept us completely engaged. So much of her lessons were seasoned with scripture that she quoted effortlessly (and no, she was not reading from her notes) I was flabbergasted by her memory! Oh how I wish I could quote scripture like that! Oh how I need to study more! But then, after a yummy lunch of delectable salads and desserts, Debbie revealed some more of her secrets to getting God's word to stick in our brains. She shared gobs of ideas from putting scripture to song, using memory short cuts to locate/recall important passages and stressed the importance of visuals (even for grown-ups! ), especially the need for a visual bible timeline (for all ages!) to help make connections of how events tie together/build upon each other. For instance, without looking, can you tell me where the story of the Good Samaritan is found? Well, If you were hurt and left on the side of the road, what would you do first? You would want to see a doctor, right? Which of the Gospel authors was a doctor? Luke. Then the chapter clue can be heard in the word Samaritan, sounds like 10, right. So, Luke 10. Neat, huh? Imagine her sharing a gazillion others too (squeal!! ), it was very cool. Here is one of her darling daughters (they were, seriously, so cute and accessorized to the hilt with adorableness) holding a poster of a song to help teach the Beatitudes. There was so much goodness packed into 5 hours, I can't even begin to tell you all of it. I know I am inspired to work harder on memorizing scripture, work harder on controlling my tongue (James 3) (not from cursing as much as negative, destructive talk), put a stop to slang words or *replacement* words (they are not gracious or pure, even though they are not technically curse words) and be more aware of what I am feeding my heart (is it Philippians 4:8 worthy?). She keeps this quote in a frame near her TV: "How dare we be entertained by the things that sent Jesus to the cross!" Ouch! Definitely something to work on there. Our words are so powerful and can also exert so much influence. They shouldn't be taken lightly, what we say (or don't say) definitely matters. She also stressed the importance of reading the Bible in chronological order to truly see the progression of events, so I hope to start that soon (I bought a chronological version of The Daily Bible). I also came home all kinds of fired up (again) to read the bible together (all of it, not just piecemeal). Scott and I have to play catch up a bit, since we didn't start in January (hello! ), but once we get caught up, the reading plan is totally doable. We've started reading together before Annelise goes to bed, so she can participate too (or at least listen). All in all, it was a FABULOUS day. 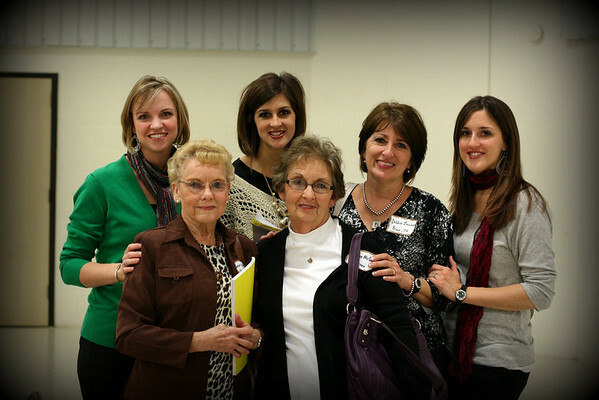 Sadly, I have no pictures of how cute my friends and I were (we were, promise), but I do have another of Debbie and her entourage (two daughters, one daughter-in-law, one mother and mother's BFF). Aren't they precious? And on a grammatical nerd side note: Am I wrong in using an apostrophe for Ladies' Inspiration Day? It's the day for the ladies, so shouldn't it need one? I hate to make errors, so if I am in the wrong, please tell me. I also hate to see the poor apostrophe misused, maligned or cast to the side and forgotten. Grammar is a slippery slope. I am inspired! Those magnet clips are sooo cute and your tables look awesome. I've been in charge of washing/drying/ironing tablecloths and I needed a little of God's Word to get through it all. Sheesh. I would've loved to be there for this, the speaker sounds incredible. 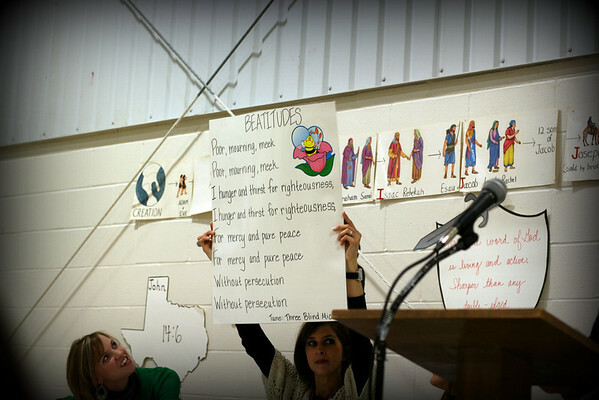 Curious, what is was the reminder for John 14:6 in the Texas poster? Anna: The Texas sign (it's actually very similar to all of our road signs here) is to remember that Jesus is the only way to heaven and HE is our road map. The highway # is John 146 for John 14:6, "I am the the way the truth and the life..."
We really do live near a highway named 146--cool, huh?--so I'll be remembering that verse! That is AWESOME!! My hubby quotes scripture like that all the time. I am constantly amazed. We gave a little presentation Tuesday night to the Young Women and he quoted scripture through the whole thing. Just pulled it out of his head. Your evening is seriously lovely. Rochelle: Thanks! That's wonderful about your hubby! I hope I can quote more one day.